I was curious why clipping shapefiles was just so difficult and whether it was different to intersecting shapefiles? Finally, I looked at this but couldn't get it to work with python 3.4. However with a large polylines shapefile (around 500mb) and a very small polygon shapefile (1mb) the intersection would take a day. This led me to think perhaps I am doing something incredibly stupid and there is a quick clip command? For example, in arcGIS the intersection command takes a few seconds so surely clipping is even easier? I know very little about GIS but to me it seems as simple as aligning the two layers by one coordinate (assuming same projection) and then selecting the outside of the clipper shape (e.g. in paint) and just deleting it from the other layer. I guess obviously this isn't the case .. Thus my goal: I create a polygon in my code and I want to clip the UK roads network I load in to the extent of that polygon, buffer the points, dissolve and then output as an array containing the polygon coordinates. I don't need to retain any features that an intersection would provide just a straight clip. I guess I also don't strictly need shape files and could convert my 500mb UK road network into a geodatabase? I wanted to post the below in-case it helps anyone. I managed to improve my clipping time considerably to 35 seconds by removing any holes in my polygon (fortunately I didn't need these holes anyway so a double-win). #ogrinfo "../ROADLINK_Project.shp" -sql "CREATE SPATIAL INDEX ON ROADLINK_Project"
@user30184 helped me to make pretty good progress and I want to share my results. Specifying --spat -> this makes my command much faster (more details below). ogrinfo "../ROADLINK_Project.shp" -sql "CREATE SPATIAL INDEX ON ROADLINK_Project"
4) If I remove the index file and re-run the ogr2ogr command it takes 621 seconds (so it appears that the index file saves me 30 seconds). Not the answer you're looking for? Browse other questions tagged python r intersection clip overlapping-features or ask your own question. Scaling attributes when clipping / intersecting in QGIS? 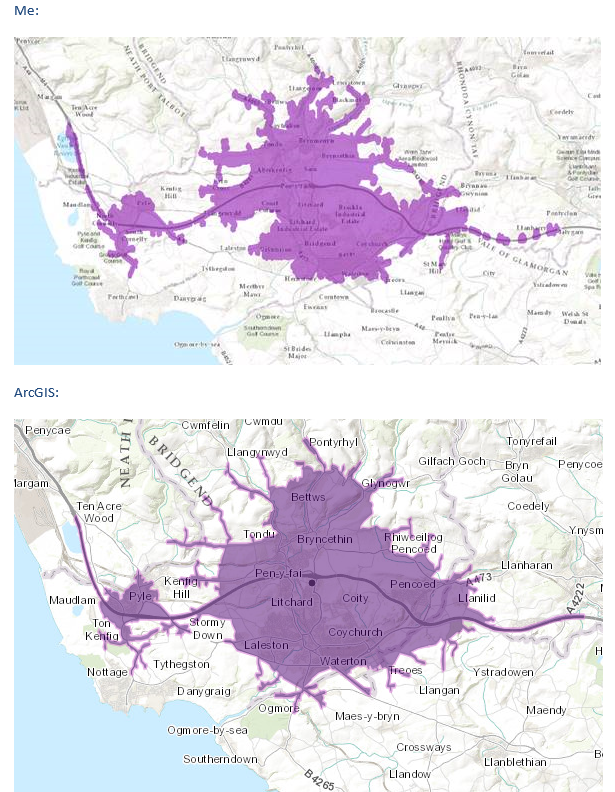 Get intersecting and overlapping point between two lines in ArcGIS? Clipping multiple rasters based on their overlapping area ArcMap?